Although this free e-book is not complete, there is enough of it finished to give you a basic idea on what to do and how to get started. If you are just starting to learn photography, then this is a great resource for you. If you are wanting to shoot images as a hobby or if you are wanting to make this as a career, this e-book will get you started in the right direction towards becoming an accompished photographer. It is being offered for free to the public for a limited time. Feel free to leave me a comment or a suggestion by using the contact us button. Got a photography tip you would like to see included in the e-book? Drop me a line and let me know about it. If you like the book and are compelled to donate towards the books completion, please feel free to do so. You will receive a hard copy after it comes back from printing. As long as you are learning photography, here is another book written by Dan Eitreim I found to be full of valuable information. You can save it and share it with others with his permission. View it here and please share it with others. If you are visiting this page from ephotozine, please send me your comments on the book. It is hard to critique your own work so I welcome and want your comments. If you are learning digital photography you will want to learn photo editing as well. Most people who are just starting out cant afford very expensive software made for editing images. However, I have found a free software called paint.net. It is a zipped file and must be unzipped but well worth the effort as it simulates Adobe photoshop. Download Paint.net here If you dont have an unzip software you can get free software from Secure Zip Express Another great free imaging software called GIMP 2.6.0 can be used like photoshop. This software is suitable for such tasks as photo retouching, image composition, and image authoring. Many people enjoy uploading their own images to the web to share with others or to post samples of their work. If you find that the images you are trying to post are too big (file too large) they may need to be resized. "Webresizer" is also free to use and can come in handy if you do not have a way to resize your images. Another great book I have found to be of use for the beginner or well seasoned photographer is shown to the right called "Guide To Great Photography". 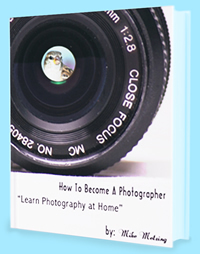 This is a very useful book and can help you along the way to becoming a better photographer. This book is much more than just a showcase of great images. Inside you will find a wealth of useful tips to help you take better photographs, along with step-by-step guides to advanced photographic techniques. Click on the book's image for more details. We want to hear from you! Leave us a quick message and we will get back with you within 24 hours. Digital Photography School Discover how to use your digital camera.